After not taking Commuter Rail for several weeks, I got a surprise as I had to pass through a gauntlet at South Station on the way to Fairmount early this afternoon. Some Campbell's-kids looking junior T employees confronted every aspiring passenger at the entry to Track 9. They demanded tickets for that specific train. I carped as I had to unburden myself of my Haymarket goodies and coffee to dig into my shirt pocket. The kid blocking me tried to be solemn in saying, "It's in the tariff!" Read more. Transit Police report they are looking for this guy for an attack at the Four Corners/Geneva commuter-rail station around 9 p.m. on Sept. 12. Read more. 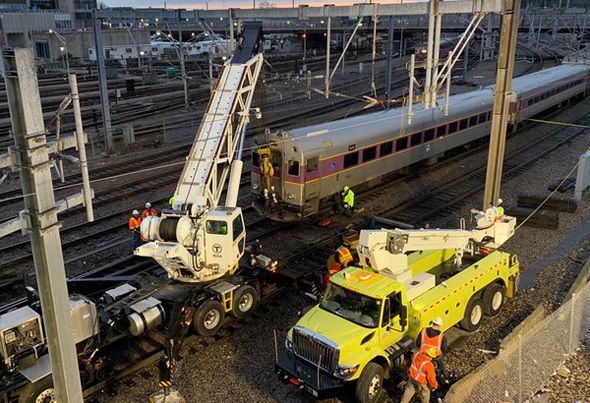 MassDOT reports that ridership on the only only-in-Boston commuter rail line increased 25% during the first of two fare-free weeks in May - and 44% the second week - but then dropped back down to normal light levels when the fares came back. The Dorchester Reporter reports that US Rep. Michael Capuano will spend roughly $50,000 in campaign funds to promote the Fairmount Line by letting everybody ride for free between May 8 and May 21. Report lists ways to put the Fairmount Line on the map. All the recent Twitter hubbub about fares at the new Brighton commuter-rail station got state Transportation Secretary Stephanie Pollack to thinking: Could there be other stations near downtown that have unfair fares? Read more. The MBTA Fiscal and Management Control Board voted today to hire a construction company to build a $17-million station for the Fairmount Line between Blue Hill Avenue and Cummins Highway, about a quarter mile outside Mattapan Square. Read more. An exhausted outbound Fairmount Line bought the farm just before Fairmount station and now the T says there are delays of 30 to 40 minutes, which is roughly twice as long as it would take the average adult to just get out and walk from Fairmount to the end of the line at Readville (yes, of course, unlike every other line, the Fairmount Line is not named for the last stop). The T reports it's trying to get the stuck switch unstuck so the train that Sam Sam was waiting for, the one just sitting there just before the Fairmount stop, can get moving again. now 754 Fairmount Readville is having engine issues after already 20mins late! WTF R WE PAYING U 4?!?! Amtrak regional train heads under bridge on way to South Station. 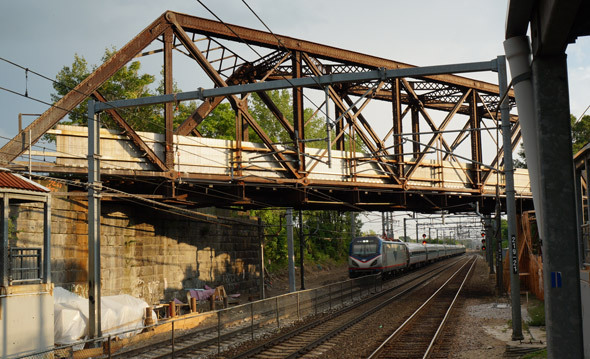 Nine years after the state replaced the old Sprague Street bridge with a ho-hum concrete span, workers are getting ready to replace the old Fairmount Line bridge over the Northeast Corridor with one of the light-blue metal spans already in use along the line closer to downtown. Read more. You never know what you'll see at the Readville train station, a.k.a. the world's largest model train set. 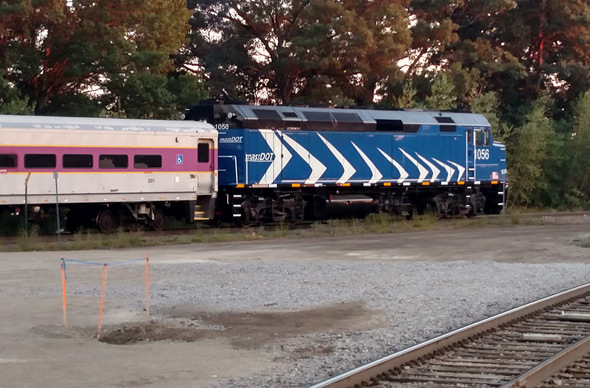 With it still being too hot to cook tonight, I drove down to Olympic Pizza in Wolcott Square, put in an order, then walked over to the station, where I spotted an unusual locomotive on a Fairmount Line train. Read more. City Councilors Tim McCarthy (Hyde Park, Roslindale, Mattapan) and Michelle Wu (at large) want the T to publicly explain why people who use the Fairmount Line or who board the train at Forest Hills pay so much less than people who take commuter rail in from Roslindale and other parts of Hyde Park in particular. Read more. Developers have filed plans for a city-owned vacant lot in Uphams Corner that would include 80 apartments, eight townhouse condos and a building for light-industrial and office use. 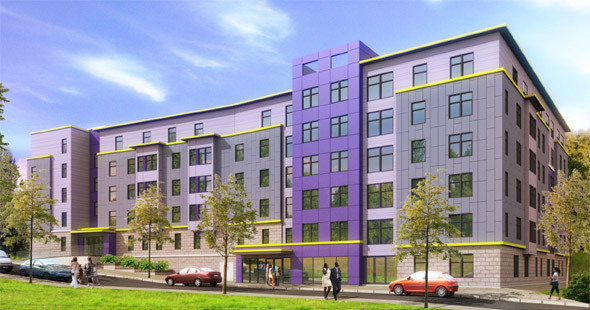 The Indigo Block, proposed by a team lead by the Dorchester Bay Economic Development Corp., would sit on a 2.75-acre lot at 65 E. Cottage St., next to the Uphams Corner stop on the Indigo, or Fairmount, Line. Read more. Public transportation is one of the great equalizers here in the Commonwealth - the artwork created for our MBTA stations is not only meant to beautify, but also to create a sense of place for people in every walk of life. The decisions we make now in renovating and rebuilding our MBTA stations will impact our communities for a very long time. Art in MBTA stations gives an otherwise utilitarian space a sense of soul, a sense of color, culture, and life, a sense of the communities that these stations represent and serve. It fosters a tremendous sense of community ownership - every time T riders see this art, it says to them, "you are home."